Tomorrow sees the Koolsport Northern Counties East Division One team at home again, this time against their own league's Premier League leaders Parkgate. The two sides met at the beginning of August in a pre-season friendly and it was Staveley who came out on top with a 4-2 win, Danny Barlow scoring two of the goals, but the form book right now suggests they will find this cup tie a difficult one. Since beating Padiham they have played three league games, all of them at home. They beat Yorkshire Amateur 3-1 before losing badly against Askern Villa last Saturday. The scoreline in that game was 3-0, but they recovered in midweek to beat Appleby Frodingham 5-1 with Joel Birks scoring two of the goals in front of an attendance of 60. With nine points from their opening four games they sit third in the league, behind both Barton Town Old Boys and Louth Town on goal difference. Travelling to Inkersall Road tomorrow are Parkgate and they've made a very good start to the season. Last Saturday they went top with a 4-1 home win against Hallam. They sit above Bridlington Town on goal difference. Ashley Worsfold scored two of those goals and he was on the mark too when they won their FA Cup extra-preliminary game to qualify for tomorrow's game. 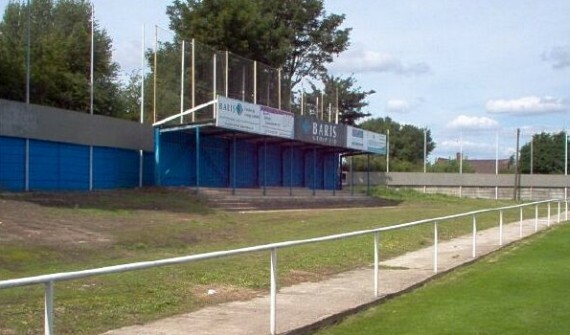 He scored the second in a 2-0 win away to Ashton Athletic, a game watched by just 35 spectators. The winners will be at home in the First Round Qualifying in two weeks against Bootle or Warrington Town.